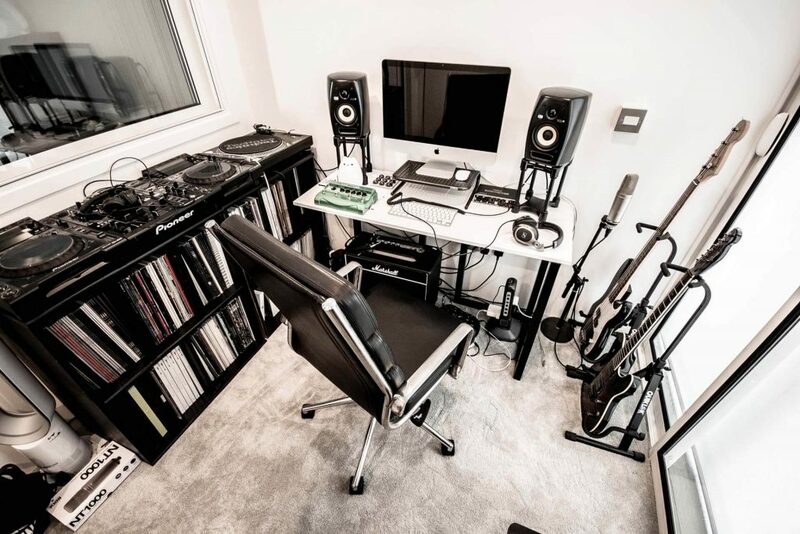 To design and build a recording studio, inside a penthouse apartment, for a professional recording artist, who specialises in House Music and Dubstep. Specifically, the client required a space to freely practice and record live music, day or night, without being disturbed or causing disturbance to neighbouring apartments. Accordingly, the studio would need to isolate a broad range of sound frequencies (40-16kHz), as per the client’s musical genre, at sound pressure levels in the region of 85-90dB (taking into account the sound insulating performance of the pre-existing partitions, off-set against background noise levels). To design and build a studio space that fits seamlessly with the surrounding architecture and reflects the client’s unique interior design aesthetic. Space designated for recording studio. Stud/Rail floating floor components, atop original sub-floor. Stud/Rail floating floor system, including acoustic insulation and timber ply deck. 1st layer of high-density, concrete-impregnated, T&G floorboards, atop ply deck. Fully installed 2nd layer of high-density, concrete-impregnated, T&G floorboards, plus 1st fix electrics. Floating floor system, isolated from original perimeter walls, with peripheral resilient foam lining. Fully independent, ‘Room Within A Room’ (R.W.A.R.) framework, suitably off-set, to mitigate unwanted interior acoustics, including flutter echoes. Independent framework, fitted with acoustic insulation. Independent framework, fitted with internal, double-paned, acoustic window. Independent framework, fitted with secondary glazed, acoustic sliding doors. Sound attenuating, air-intake and out-take ductwork, fitted above independent framework. Independent, framework, fitted with resilient bars. Fully boarded independent framework, ready for plastering. High-density, acoustic door (internal face), fitted with double acoustic perimeter and threshold seals. High-density, acoustic door (external face), designed to close flush with surrounding wall-sections. High-density, acoustic door (external face), fitted with flush-pull handle. High-density, acoustic door (internal face), fitted with concealed mortice hinges. Electrical switches, fitted with acoustic back-boxes.